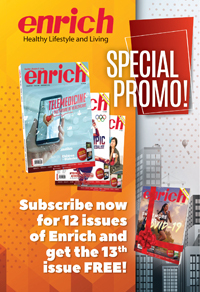 thoughtful features from a stable of renowned foreign and local contributors, ENRICH serves to inform and entertain readers as well as act as a bridge between Mercury Drug stores and their customers. ENRICH is released monthly with a print-run of 30,000 copies. ENRICH aims to inform its readers on the latest updates in the world of business and lifestyle, as well as highlighting the synergy between Mercury Drug and its customers. With aspirational features covering topics from investment and health to lifestyle and culture, ENRICH is the custom magazine of choice for those wishing to keep in tune with what’s happening around the region. Discussion about top stories from around the world, especially those concerning the Philippines, on business, environment and lifestyle. Tips and tricks from the experts on how to invest and manage money. In-depth coverage of specific business, social and lifestyle topics that are currently making the news. Also includes sections of local features highlighting the culture, art and heritage of the Philippines. Expert report on new findings, treatments and medical discoveries to inform and enlighten the reader. News and latest offers, exclusively for Mercury Drug customers. The latest trends in clothing, jewelry and beautification products.